Germany’s wind power obsession has turned picture postcard landscapes into alien, industrial war zones – of the kind dreamt up by futurist HG Wells. In the beginning, carpetbaggers, rent seekers and their eco-zealot, shock troops sold the ‘transition’ to an all wind and sun powered future as an ecological idyll. Except, the reality has fallen well short of the original pitch. German communities, just like those everywhere else, are angry at watching their property values plummet; homes made unlivable, due to the constant bombardment of wind turbine generated low-frequency noise and infrasound; and real environmentalists are furious at the destruction of ancient forests, and the carnage meted out to a menagerie of birds, bats and other critters, made homeless by the destruction of their habitats. All, of course, to ‘save’ the planet. In short, what seemed like a good idea at the time, has turned into a daily nightmare for rural Germans. Here’s No Tricks Zone detailing the depth of the disaster, and the scope of the furious response. 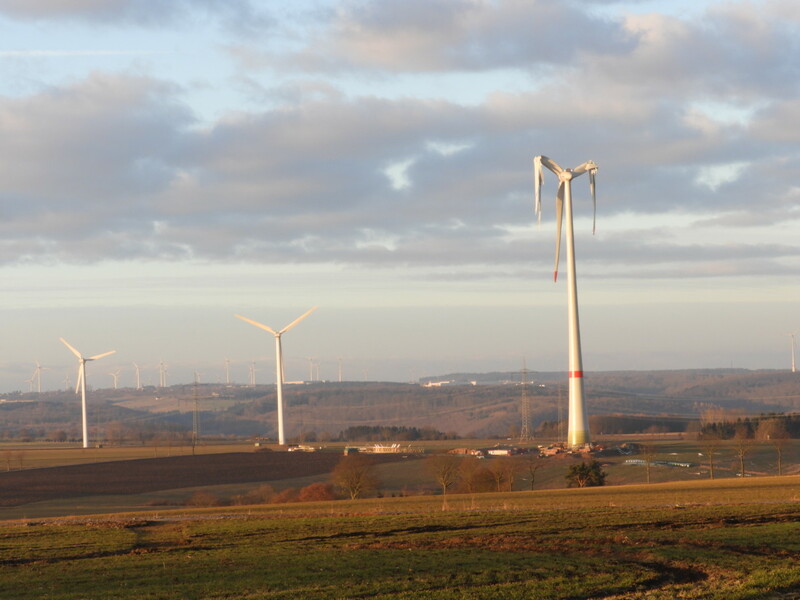 Public opinion of wind energy in Germany, once unanimously high, has eroded considerably over the past years as more people begin to realize that the country’s once idyllic countryside is turning into a blighted industrial landscape. The earlier visions of environmental purity are instead turning out to be illusions by con-artists. The reality is an environmental hell. Wind energy is destroying the country more than any other industry. The wind industry is not satisfied with that. It wishes to subject the entire country to its moral galvanized industry. Whether it’s Magdeburg or Warburg Saxony Anhalt regions, whether it’s Holstein or the lower Harz region – everything is rotating and blinking, the further north you go, the worse it is. Büscher forgot to mention “whooshing” and “shredding”. As incredible as it may be that a country managed to get its citizens to march into the murderous folly of Nazism some 85 years ago, a similar phenomenon is happening today on the environmental front: there’s now the mad march into environmental murder. The collective German conscience still truly believes it’s all going to rescue the planet from a climate calamity which a group of (false) prophets foresee arriving in the year 2100. Environmental purity awaits! Of course wind industrialization cannot be compared to Nazism on the scales of murder and destruction, but the path and development stages of the two insanities are the eerily similar. Both proceeded as follows: 1) visions and promises of purification, 2) the mad, blind rush into the project 3) critics silenced, 4) signs of mounting failure ignored, 5) denial, retreat to the bunkers and 6) in evitable self-destruction. In both cases it’s all brought on by intoxicated leaders, one-sided media apparatus, crony industries, dogmatist institutions and unscrupulous banks. Once madness goes collective, it becomes very difficult to stop. When Germany gets an obsession in its head, the only thing that is left to stop it is the act of letting it play out and until it destroys itself. We may soon be witnessing the Rise and Fall of The Environmental Reich. Currently we find ourselves somewhere between phases 4 and 5. Fortunately there are shimmers of hope that leading politicians are beginning to understand, as the newly formed Merkel-led government seems to be in no hurry to keep promoting big wind at any cost. Not only is the environmental price mentioned by Büscher excruciatingly high, but so is the financial price of the Energiewende, this according to former German Transportation Minister, Peter Ramsauer, now Chairman of the Committee for Economic Cooperation and Development. Ramsauer warned against the hasty shutdown of half of the country’s nuclear power plants in the wake of the Fukushima disaster back in 2011, “but no one wanted to listen”. In the late afternoon/early evening of March 8, 2018, two 56 meter blades of a brand-new ENERCON E-115 wind turbine were completely ripped apart – parts flew more than 800m. This is the third heavy windmill incident in Keis Paderborn in the last 2 years. Neither owner ENERCON nor builder WestfalenWind notified either the public or the police after the incident, even though there was serious danger to life caused by blade shards and flying fragments. The area around the damaged wind turbine was cordoned off with police patrol cars, only after an Ettelner citizen had notified the police. 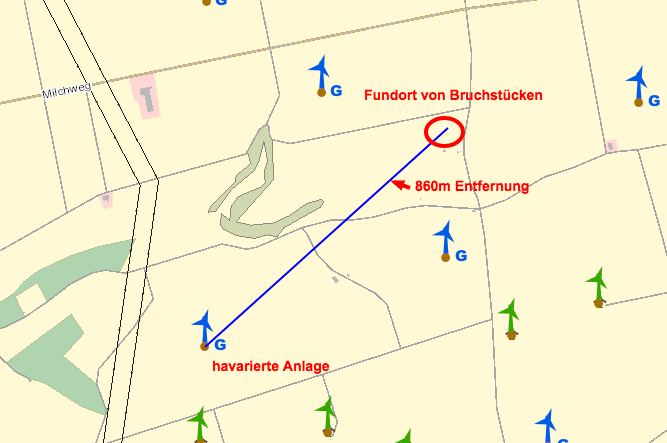 The perimeter affected by the incident site reached almost to Etteln. The blades had only been mounted on March 6, and the system was not connected to the mains. Apparently the machine overran and the blades could not be stopped; the blades were only turning at 19 km/h when they were torn to pieces. How far would parts have flown if the blades had been shredded at higher operating speeds? 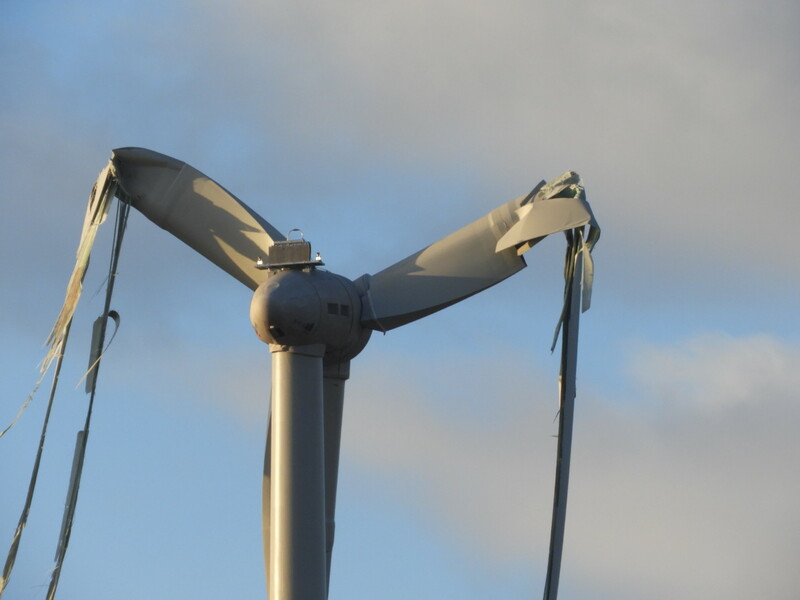 ENERCON/WestfalenWind have sought to play down the incident – claiming that the blades were merely “broken off” and dropped directly to the ground. So, how was it that blade parts were found over 500m from the tower? It was pure luck that no one was injured in this spectacular and terrifying event involving a brand new wind turbine at Borchen-Etteln. The shredded windmill sits between Dörenhagen and Etteln in the borough Borchen in the southern circle Paderborn. 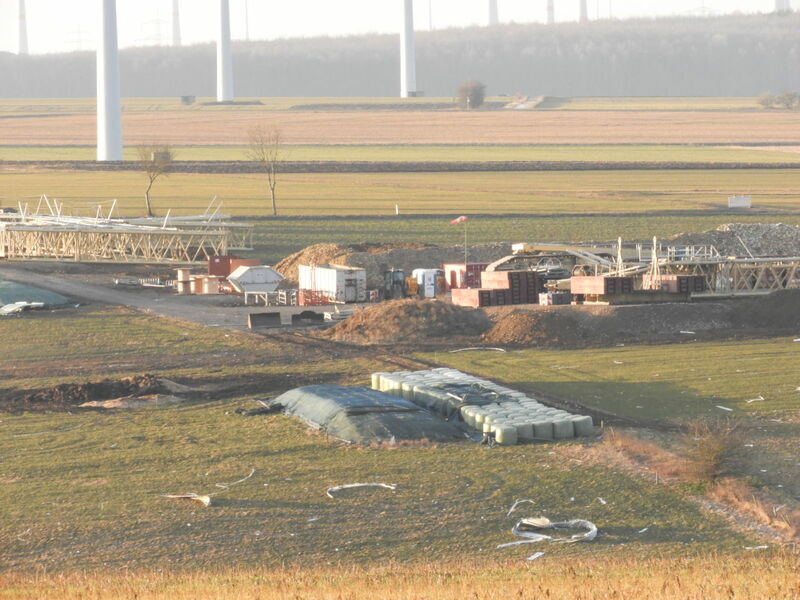 Just a few meters away, another 6 wind turbines of the same type are currently being built. 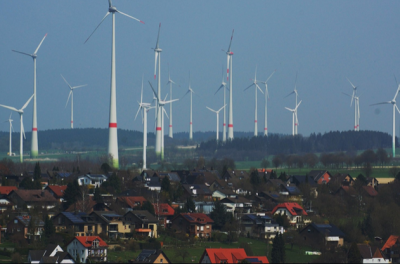 The turbines are only being built because the CDU and the Greens in the Borchen town council overrode a decision taken by the municipality against these wind turbines last year. 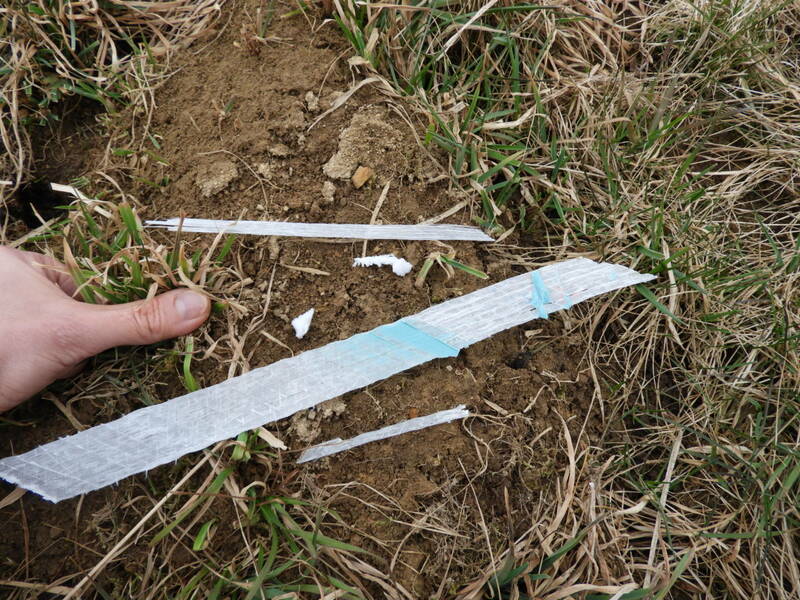 The turbine’s blades disintegrated, spreading splinters and shards of fibreglass over a huge area, many of these fragments are very small (see photos); removing them all will be almost impossible. The result is a true environmental catastrophe; the whole environment is now polluted with tiny glass fibre particles. How do ENERCON/WestfalenWind expect to ensure that all of its toxic fibreglass is collected and removed? Borchen Mayor Allerdissen has demanded a halt to further construction, until the cause is properly identified. The area is now seriously contaminated, covered with thousands of razor-sharp fibre glass fragments and particles, posing a danger to wild animals and grazing cattle. The next hay harvest in the area also poses a risk to cattle, with fibreglass fragments likely to contaminate their fodder. Locals are now unsure how safe it is to live next to wind turbines that are prone to explode without warning. With so many wind turbines likely to repeat the performance, and huge area contaminated by toxic fiberglass, it’s understandable locals are now sceptical about ENERCON/WestfalenWind’s assurances about safety in the future. Credibility of wind turbine safety claims just got shredded. France is following the same model, though a few years behind the Germans. Huge swathes of the French countryside are being disfigured forever on the back of eco communists lies and propaganda. We are fighting but with the backing of the French state we are being steamrollered. It breaks my heart. You did it in 1789, it is time to revolt again. Fight them and never surrender. These expensive environment destroying obscene parodies of Green power need to be scrapped. The Green party are more destructive to the lives of the public and the environment than any nuclear plant.